Regatta chronographs are relatively rare, but this year there are a few new watches designed specifically to provide the countdown function. Panerai has committed considerable resources to the 2017 America’s Cup, with partnership deals with the defending Team Oracle USA and to the Softbank Team Japan. Bremont was partner to Team Oracle for the World Series and then stepped down from Oracle in order to focus on their America’s Cup watches for the final. Ulysse Nardin has partnered with Swedish team Artemis Racing. A regatta is complicated because the actual start time is decided aboard the jury boat, according to the weather and other factors. There is a first signal, typically ten or five minutes before the start. Then a second preparatory signal, say five or three minutes before the start, and another one minute before. So, it’s likely that you start your chronometer a few seconds late at the first signal. The second signal enables to you synchronize to perfection. Here are five regatta chronographs, offering the countdown function in different ways. 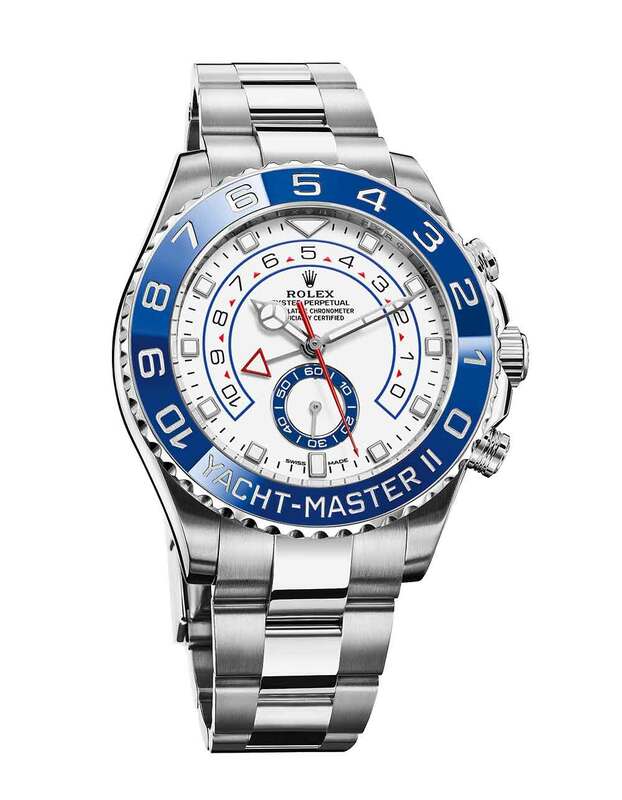 The latest version of the Rolex Oyster Perpetual Yacht-Master II is an exceptional watch for the intelligence with which the Rolex designers have incorporated the countdown. You programme the watch with the countdown duration, which depends on the regatta rules. You rotate the bezel – Rolex call it the Ring Command bezel – anticlockwise, which enables the countdown duration to be set by means of the crown. The bezel serves only for this: the numbers on the bezel match those of the countdown in minutes and provide visual reinforcement. At the signal, you press the pusher at 2 o’clock, and the red seconds hand starts moving as in any chronograph. The countdown minute hand starts moving from the preset number of minutes on its way towards zero. When the second signal comes around, you get a chance to synchronize the watch more exactly, by pressing the pusher at 4 o’clock. This is identical to the flyback function on a chronograph: the seconds hand whips back to zero and starts off again instantaneously. The minute hand moves to the nearest minute – after all, the watch will only be a few seconds out of synchronization and so there’s no chance of it going a minute forwards or back. It’s this part of the procedure that is so brilliant: synchronization on the fly. Most of the dial is dedicated to the countdown. The time functions are of secondary importance but are clearly legible, with a subdial at 6 o’clock for continuous seconds. The watch has a case 44 mm in diameter, whose water-resistance rating is 100 metres. The steel version costs €17,350, £13,700, steel and Everose gold €23,450, yellow gold €40,500. Read more here. 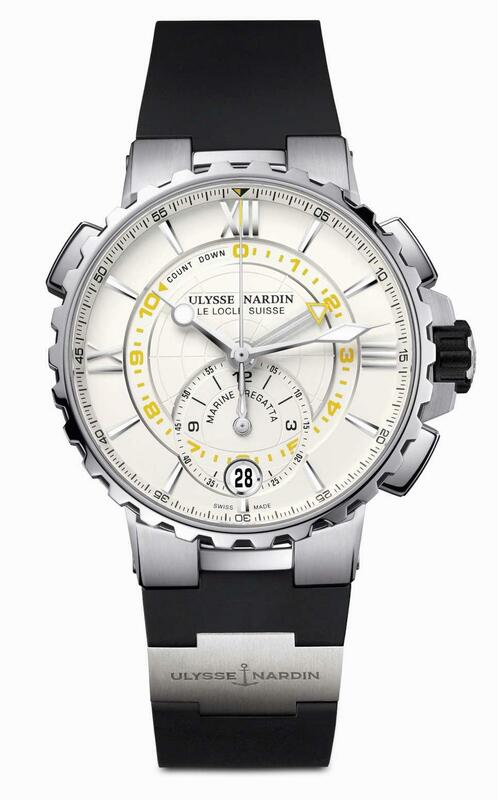 The Marine Regatta by Ulysse Nardin is unique in that both the chronograph seconds and minutes hands move anticlockwise towards zero during the countdown, and then spontaneously start running in the normal clockwise direction. It’s an appealing, fascinating sight. A hand with a yellow arrow tip is used to set the countdown, using the pusher at 10 o’clock, on a scale from 1 minute to ten minutes. When you start the chronograph, the chronograph seconds hand starts running backwards, counterclockwise, and the countdown hand also moves backwards. When they both reach zero, the chronograph second hand automatically reverses, becoming a conventional chronograph. Simple and user-friendly. The chronograph records time on a large subdial at 6 o’clock, with two hands for minutes and hours. There is also a circular window for the date. The case is large at 44 mm diameter, in stainless steel, water resistant to 100 metres, with a screw-down crown coated in rubber. 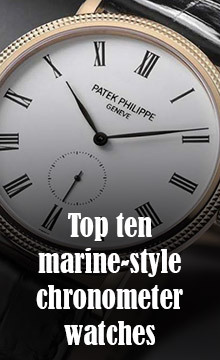 The watch won’t have any problems with a bit of spray as you are crashing through the waves. There are two colour variants, ocean blue and white. The strap is in rubber with a folding buckle. Read more here. 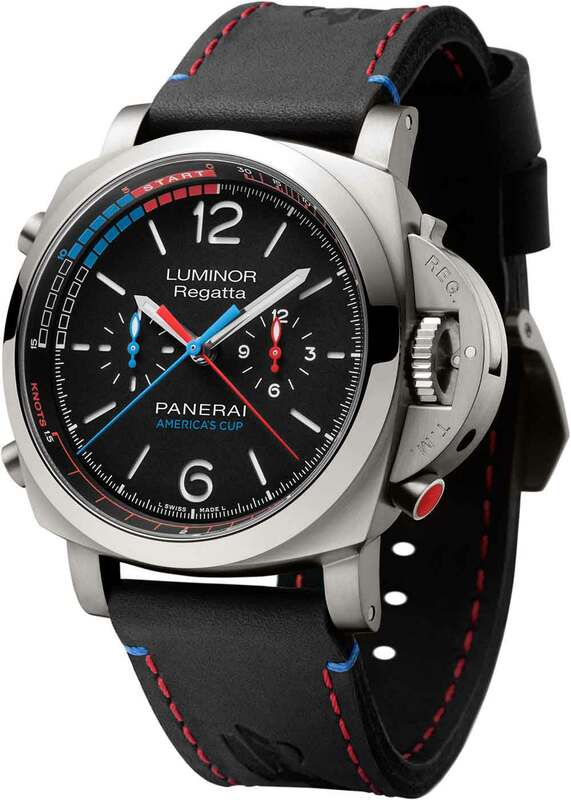 The most complex of the watches that Panerai have launched as part of their America’s Cup 2017 partnerships is the Panerai Luminor 1950 Regatta Oracle Team USA 3 Days Chrono Flyback Automatic Titanio 47 mm (PAM00726), a large piece with a chronograph movement that has been adapted and given another pusher to add the regatta-start timing function. It has a good water resistance rating, 10 atmospheres (100 metres). The watch is powered by the P.9100/R self-winding movement, a development of the P.9100 with the addition of the mechanism that moves the red chronograph minutes hand back, one minute at a time. The countdown function is easy to use. By pressing the red push-piece at 4 o’clock, you can move the central chronograph minute hand back in one-minute jumps, until it is set to the correct countdown position. When the first pre-start signal is given, you start the chronograph using the conventional start/stop pusher at 10 o’clock. The blue chronograph seconds hand and the red chronograph minutes hand start to move, indicating minutes and seconds before the start. At the start, they continue as normal to show the elapsed time, in seconds and minutes, with hours shown on the subdial at 3 o-clock. The colour-coding makes the functions obvious. To take a time during the regatta, you press the start/stop pusher. The pusher at 8 o’clock returns all the chronograph hands to zero or, if it is pressed when the hands are already moving, it operates the flyback function, returning the hands to zero and instantaneously restarting them, enabling a new time interval to be measured. The only problem with this layout is that there is no way of adjusting the accuracy of the countdown. You have to start the reverse chronograph at exactly the right moment at the number of minutes specified in the regatta instructions before the start, say five minutes. You can use the flyback function to restart the chronograph accurately at the one-minute signal so that you can see how much time you have left until the start, and then again at the start of the regatta so you can take a total time for the race. The watch is a limited edition of 200 units, and it costs €17,400, £14,450, available in boutiques from February 2017. The special presentation box includes a rubber strap and a strap-changing tool. Read more here. 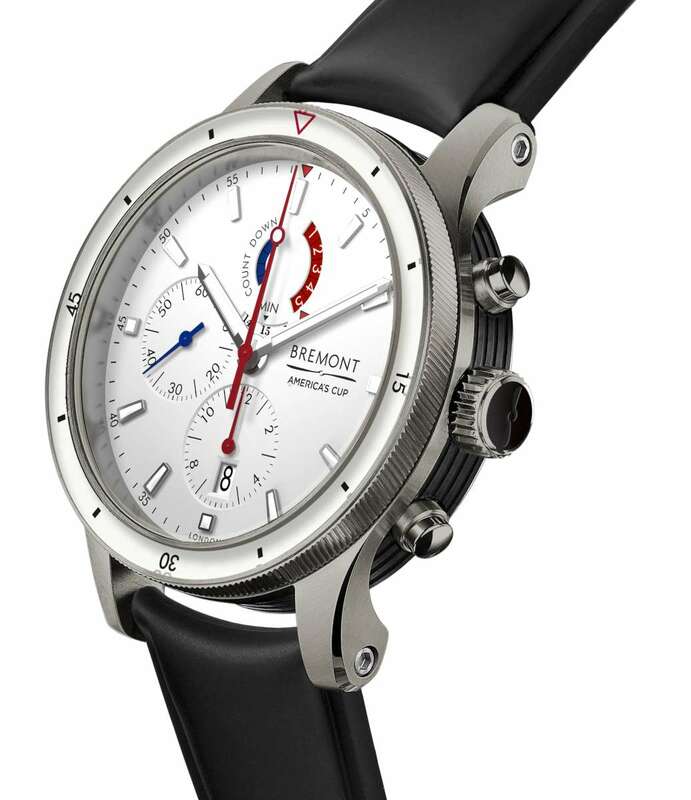 Bremont’s chronograph regatta watches were developed as part of their role as Official Timing Partner to the 35th America’s Cup and to the defending team Oracle Team USA, an agreement that began in 2015 and was going to continue to the final races in Bermuda in 2017, but something changed on the way and Bremont are no longer partnering with Team Oracle. The piece shown below has a numerical 15-minute display countdown and a 5-minute-to-start time. Instead of the conventional chronograph minutes subdial at 12 o’clock, there are three arc-shaped counter windows. When you press the chronograph start pusher, the blue window gradually becomes red, revealing the word “START” letter by letter, while the red arc counts down from 5, progressively becoming blue. At the same time, the minutes counter counts up to 15 minutes. After 5 minutes, the red and blue arcs recommence their cycle, and after 15 minutes, the 15-counter below also starts again. So this unusual countdown indicator can also be used to time events, just like a normal chronograph, because at any time the minutes counter indicates up to 15 minutes, and the hour counter at 6 o’clock has 15-minute markers. The Regatta Otusa has a bi-directional rotating bezel is and so it can be used with the chronograph seconds, or the minute or even hour hands, as another method of timing events. The case has a water resistance of 10 bar, 100 metres. The Bremont Regatta Otusa is a limited edition, with 235 pieces in the two white and black series. Each watch is individually serial numbered and supplied with COSC certification. Price is £4,995. It has been available from June 2016. Everything about the Cvstos Sealiner Chrono Regata, presented in 2016, is in a nautical spirit, with a screw-down crown in the shape of a winch, chronograph pushers recalling cleats, and, at the base of the dial, teak deck planking. The dial has the same sort of visual complication of a yacht, with all its pulleys, wheels and winches. At the centre, hour and minute hands, and chronograph seconds. At three o’clock, the power reserve indicator with a scale from 48 hours to zero, and a date window that frames the number on a laser-cut disc. At six o’clock, chronograph hours, with a pointer on a structure that has the classic pulley motif at the centre, and a sort of helm design around it. At 12 o’clock, the chronograph minutes counter has, at its centre, a disc with a series of 5 cut-out holes, above a background divided into 6 colour-coded sectors. These are used for the countdown. At the signal marking five minutes before the start, you start the chronograph, and the chronograph minute pointer starts to rotate, along with the disc with the five perforations. This enables you to see the progress of the minutes: after each minute, another of the five windows turns blue. If you wait another five minutes, the windows all become red, and so on. The last five seconds before the start are shown by the red sector at the top of the dial. The case has a water-resistance rating of 100 metres, so it would be safe to take it on board a yacht. 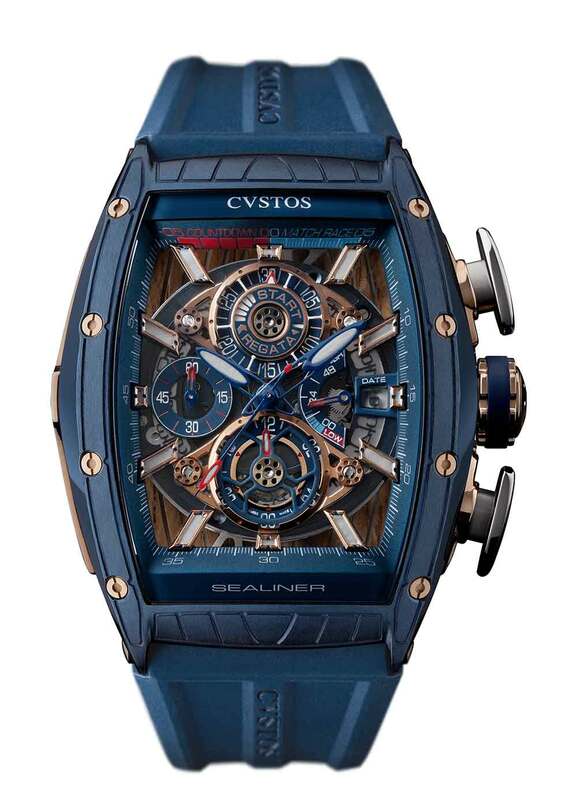 The Cvstos SeaLiner Chrono Regata starts from 24,000 Swiss francs. Read more here. 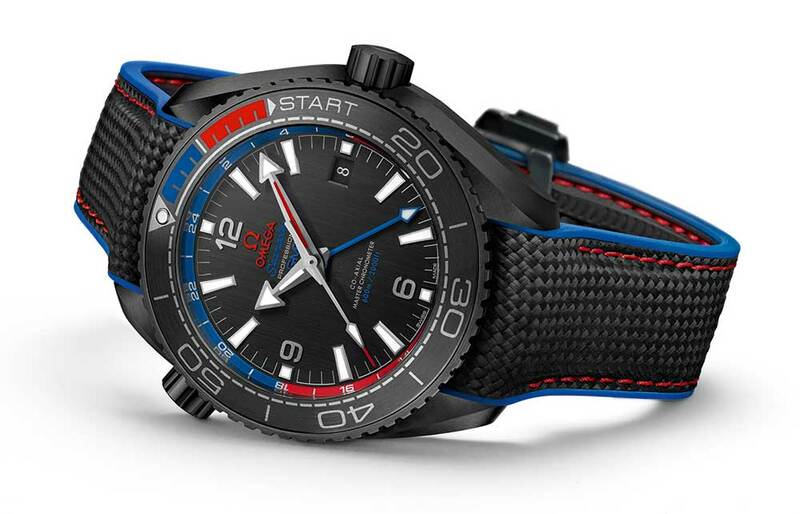 This watch celebrates the brand’s partnership with Emirates Team New Zealand in the 35th America’s Cup. It’s not a chronograph, and the regatta countdown function is limited to a rotating bezel marked with the first ten minutes, so that you can perform an approximate countdown using the minute hand. More here.